The First Presbyterian Church, one of whose founder Sarah Colt, instituted the first-ever Sunday school program in New Jersey, is set to clear final hurdles before receiving local historic landmark designation. Erected in 1852 on donated land from the Society for Establishing Useful Manufactures (S.U.M. 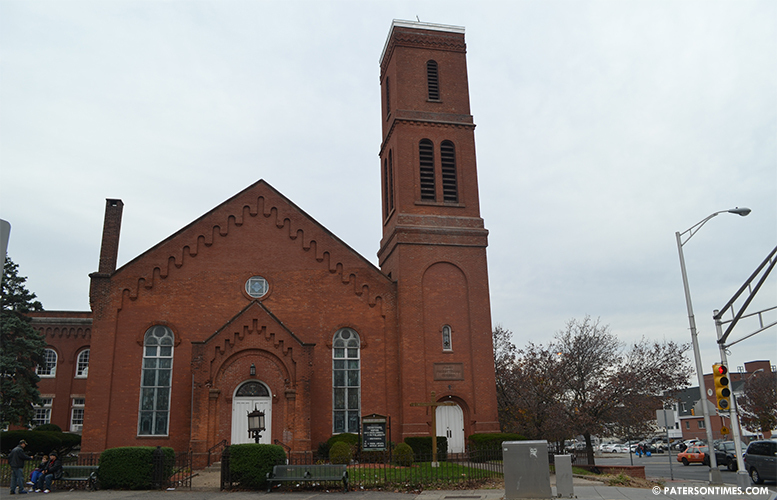 ), at the corner of then Ward Street and the Hamburg Turnpike (now Main Street), the church has been continuously used as a house of worship for over 160 years. Colt, who came from the First Presbyterian Church in Newark, and played a pivotal role in the church’s founding, is not well-known for having established the first Sabbath school in the Garden State, possibly, because there is almost no surviving record proving as much. A lecture by Henry Clay Trumbull, a clergyman, and carried by the New York Times give testimony to Colt’s role in the Sunday School Movement. She founded one of the earliest Sunday schools in the country in 1794. The society granted the land in 1813 to the First Presbyterian Society in the town of Paterson, which raised funds and set plans in motion for the church’s construction. In 1814 construction began at the site, by 1819 a church stood at the location. Less than a decade after its completion, the church suffered a setback: it was burnt to the ground. In 1850, the church again caught on fire, when a tinsmith working on the roof had his charcoal furnace overturned, resulting in the building being completely destroyed. The city’s then local volunteer firefighters made attempts to extinguish the fire by pumping water from the nearby Dublin Spring without success. The congregation again set to rebuild the church after the devastating fire. On November 16th, 1852 the new building, the one that currently stands at the site, was dedicated by church members. Prominent city residents contributed to the church’s success. Jennie T. Hobart, wife to United States vice-president Garret Hobart, and another church member, established two $1,000 scholarships to send “worthy young men or young women” to Geneva College, a Christian college in Beaver Falls, Pennsylvania. In the 1880s, the church’s committee sought to establish a new location, settling on the corner of Graham Avenue and Broadway. The cornerstone of the Broadway church was laid July 2nd, 1885. A year later, the Main Street church lost almost 100 congregants to the newly established church. Naturally, with the loss of congregants the church fell in financial straits. Today, the church is being utilized by Iglesia Presbiteriana, a Hispanic Presbyterian congregation. The congregation is attempting to sell the property. With historic designation, already approved by the city’s Historic Preservation Commission, the congregation is hoping the character of the church will remain unblemished. According to the commission the church is eligible for listing on the National Register of Historic Places. A nomination was submitted some years ago, however it has yet to be completed. Council members gave the church precursory approval for inclusion in the city’s local landmark list last Tuesday — a final approval is to follow in December.